Want to be homesick for the many fruits and vegetables available in Guyana? Well look at this video of a roadside market at Mon Repos on the East Coast of Demerara. This is just one of the many markets around Guyana. Guyana is not a place on most tourists’ radar. It should however figure prominently on a rum lover’s bucket list. All of the world’s fantastic Demerara rum comes from here and from just one distillery, the Diamond Distillery of Demerara Distillers Limited. Demerara gets its name from the river that runs through the capital Georgetown and the region. Demerara Distillers makes over two dozen rums for other spirit companies around the world and they sell a lot of young rum spirit in bulk. For example I saw bottles of Pyrat rum (Patrón Spirits Company) being packaged when I was there and pictures of Lemon Hart rum being bottled. I also learned that some American bourbon companies were buying the young spirit to make up the 49% of their product that doesn’t need to be corn spirit based. In the city of Georgetown there are beautiful, scenic gardens that delight the eyes of citizens and tourists alike. Lovers of nature are enthralled by the splendour and profusion of flowers in these gardens. Today I will focus on the Botanic Gardens and Zoological Park, the Promenade Gardens, and the Company Path Gardens. 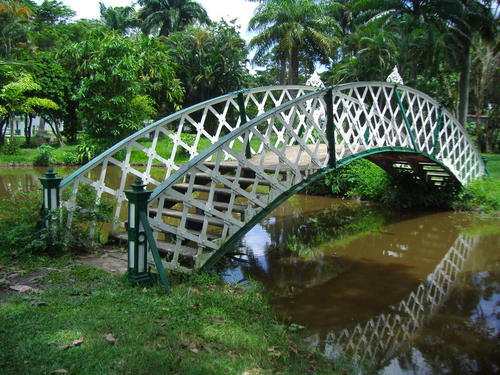 The idea of the Botanic Gardens was conceived by the Royal Agricultural and Commercial Society when in 1877 it passed a resolution for a letter to be sent to the Governor and Court of Policy for the organization of a Botanical and Horticultural Garden in the city of Georgetown. Consequently, the government bought the backlands of Vlissengen (276 acres for $72,000). A portion of this land was reserved for the gardens.